Illustrated book by Sandow Birk, depicting Dante's "Divine Comedy"
In this five-year project, Birk adapted the entire text of Dante's Divine Comedy into contemporary slang and set the action in contemporary urban America. 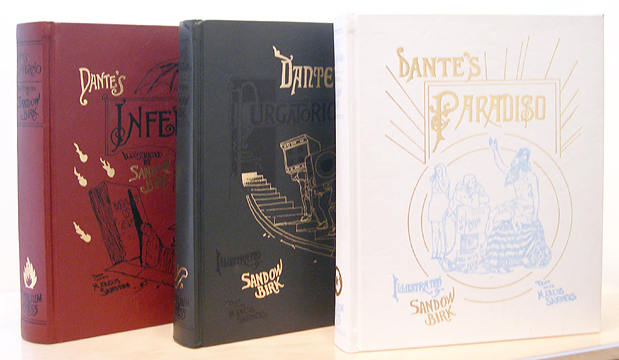 The project resulted in three, limited edition books, Dante's Inferno, Dante's Purgatorio, and Dante's Paradiso, each containing more than 60 original lithographs and published by Trillium Press in San Francisco. This work is part of Sandow Birk's epic series "Dante's Divine Comedy," a five-year project, which involved adapting the text of Dante's entire "Divine Comedy" into contemporary slang and setting the action in urban America. The third book in the series, "Dante's Purgatorio," is set in San Francisco and contains multilingual icons and signs in Spanish, English, Chinese and Japanese, evoking San Francisco's multiculturalism. In "Purgatorio: Canto IX," Birk's gates of Pergatory resemble the facade of of a Hindu temple, commenting on the multiethnic and multiple faiths of our modern-day society. From the outset of Birk's Dante's Divine Comedy project, there was the intention to make a contemporary film without the aid of any computer effects whatsoever – to make a film that was true to a toy theatre production of the Victorian era. As with the book projects, the inspiration for the look of the film were the engravings of Gustave Doré, but now developed in the contemporary works of Birk’s illustrations – setting the action in urban America. The filmmakers wanted to retain the look of engravings in both the puppets and the world they inhabit. As the script was developed, each scene of the film was storyboarded and the action was broken down to specific movements and facial expressions. For each new feeling or action, a new puppet had to be made - more than 100 for protagonist Dante alone - resulting in more than 500 puppets in the production.